This WMRK-2436SVR-AB 36" Overall Depth/33-1/2" Useable Depth Multi-Vendor Server Enclosure (42U) from Middle Atlantic is a rack optimized to work with the most popular series of servers on the market and extend their life through passive thermal management. This model is constructed of welded steel to ensure years of use. Moreover, it will support up to 1000 pounds of equipment. The front and back of the rack feature adjustable cage-nut style rails with Z-rail adapters that will accommodate most server-slide kits. The front door, split rear doors, and the top of the rack are all perforated with a 64% open area to promote airflow and keep your equipment cool. A pre-installed temperature display with a sensing probe and plug-in power supply also facilitate control of temperature within the rack. The top of the rack includes (5) integral 4" gland grommets for a cable pass-through and will also accept a 6, 9, or 12" cable ladder. Multiple racks can be ganged together when fully loaded (order base models with side panels and ganged models without side panels). Ganging hardware is included with the rack. This model also ships with a mounted 20A vertical power strip. This rack is optimized to work with the most popular series of servers on the market. 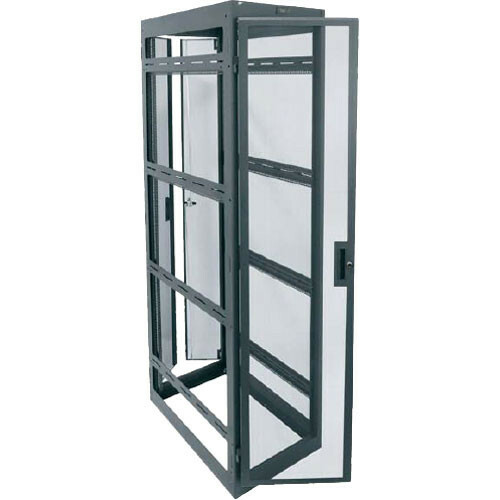 The front door, split rear doors, and the top of the rack are all perforated with a 64% open area to promote air flow and keep your equipment cool. A pre-installed temperature display with a sensing probe and plug-in power supply also facilitate control of temperature within the rack. Welded-steel construction guarantees exceptional strength and years of use. Rack rails are labeled in EIA standard rack-space increments allowing for easy equipment alignment. Pre-installed washers on all 10-32 threaded rack screws save installation time. RackTools free layout and specification software is included for effective system design help. Dimensions (HxWxD) 79-5/8 x 25-9/16 x 36"
Box Dimensions (LxWxH) 86.0 x 39.0 x 27.0"